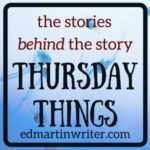 Thursday Things: The best book store in North Carolina closed! One of the settings in my novel Yours to Keep or Throw Aside is a bookstore, McKay’s, in downtown Asheville, North Carolina. It’s where Andrew and Kasey, the two main characters, meet, and several scenes take place in its attached coffee shop. While Asheville does have a downtown bookstore, I actually modeled McKay’s after the Books-A-Million I worked at while I was in college – not that the specific details of the store actually matter to the story, other than it has coffee, books, tables, and couches. I don’t think its baristas or employees even have names. I stole the name from my favorite used bookstore, Edward McKay’s in Raleigh, NC. I probably spent way too much money there (is that even possible at a used bookstore? ), but they had a wonderful selection of everything – lots of obscure titles that look great sitting on my shelf, waiting to be read. When I was back in the Triangle in March, I may have spent an hour or two there, browsing the shelves and buying a couple bags of books. AND NOW THEY’RE CLOSED FOREVER!!!!! About a week or two ago, without any warning, they announced they’d permanently closed that store (although they still have a couple locations around the state). Good news, however, in that MY McKay’s – my fictional one in Asheville – is still open, and it’ll even have a brief cameo in the sequel to Yours to Keep or Throw Aside that I’m currently plotting out.